It took only 20 seconds for a car thief to break into an older-make Subaru. In under a minute, the suspect was driving away. That's according to recent surveillance video reviewed by Sgt. Ty Witte with the Anchorage Police Department, which Witte said showed exactly how quickly a car can be stolen. As Anchorage struggles with a car theft epidemic, police say a new target is emerging for thieves: 1990s Subaru vehicles. Subarus are favored by many Alaska drivers, and vehicles from the 1990s are especially susceptible to theft, Witte said. For a while, Chevrolets were a main target for car thieves. That trend appears to be dropping off some, Witte said, after a theft ring was busted in October. "This thing with the Subarus however, it seems to be a different group, a different skill set," Witte said. Would-be thieves are altering existing Subaru keys, rounding the edges and filing down the teeth, so that the keys work in many different cars, Witte said. Or, they'll go to stores that cut keys and get blank keys, sometimes in bulk, and file them down so they unlock and start different makes and models of the car. The "entire decade" of 1990s Subaru vehicles are "prime" for this type of car theft, Witte said. Those cars lack a key chip security feature that Subaru has since introduced and generally seem to be susceptible to blank and altered keys. Anchorage police on Monday announced the arrest of seven people in connection with stolen cars over the weekend. One woman, 25-year-old Lydia Barce, was arrested after she was spotted in a 1991 red Subaru Legacy in the parking lot of Alex Hotel and Suites, on the 4600 block of Spenard Road. 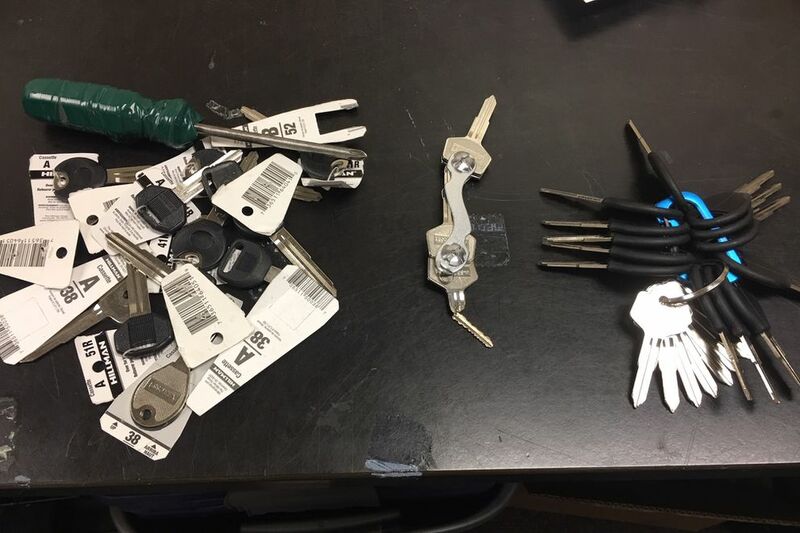 Inside the car, detectives found a number of blank keys that appeared "to have been taken (from a store) in bulk," Witte said. Worried about your car? There are steps you can take to protect yourself. Don't keep valuables in your car. Cars are being stolen for the valuables inside, which are then traded, often for drugs. Get a tracking chip for your vehicle, so if it's stolen you can trace its whereabouts. Another option is a steering wheel lock, like The Club, which locks the steering wheel. "Anything that would cause a thief to look and say 'this is going to be too difficult to deal with,'" Witte said.